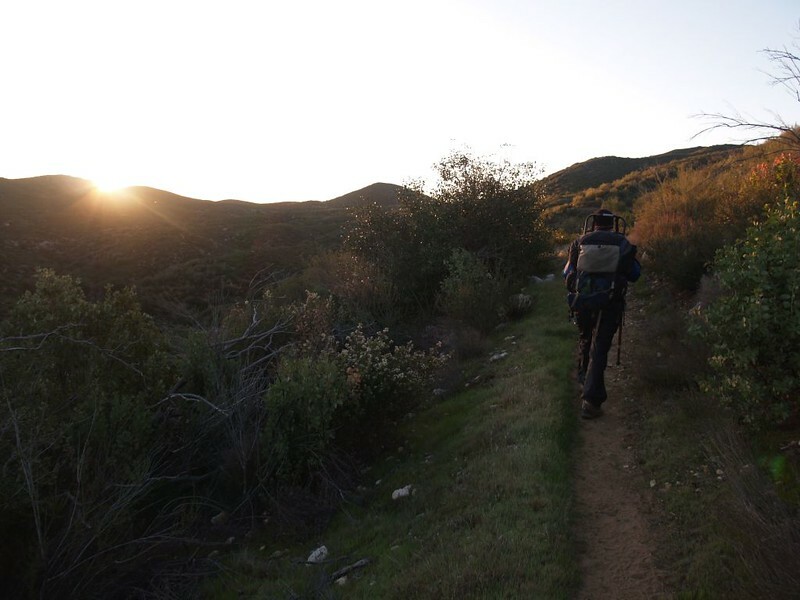 Continuing this year’s PCT extravaganza, Vicki and I decided to tackle the 24 miles of very dry hiking between Routes 78 and S22. 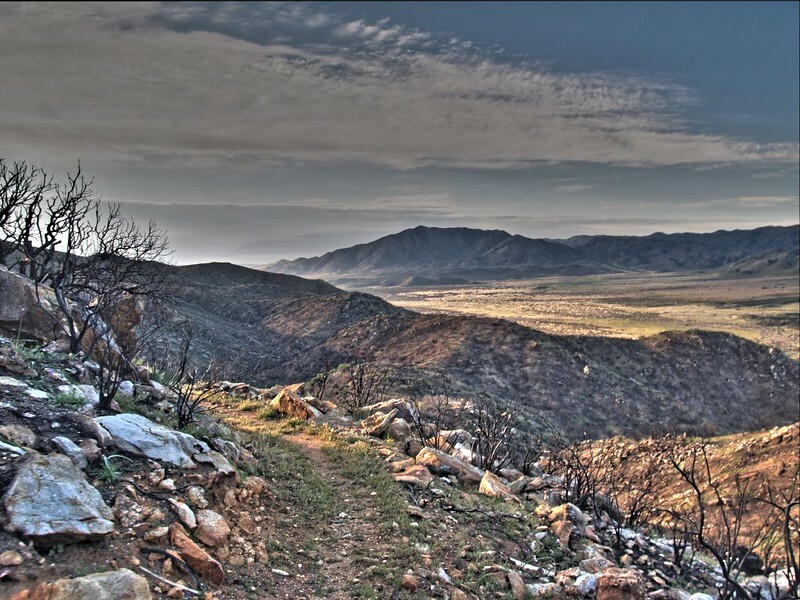 This hike lies within Anza-Borrego Desert State Park, and is known for being one of the driest stretches in Southern California. 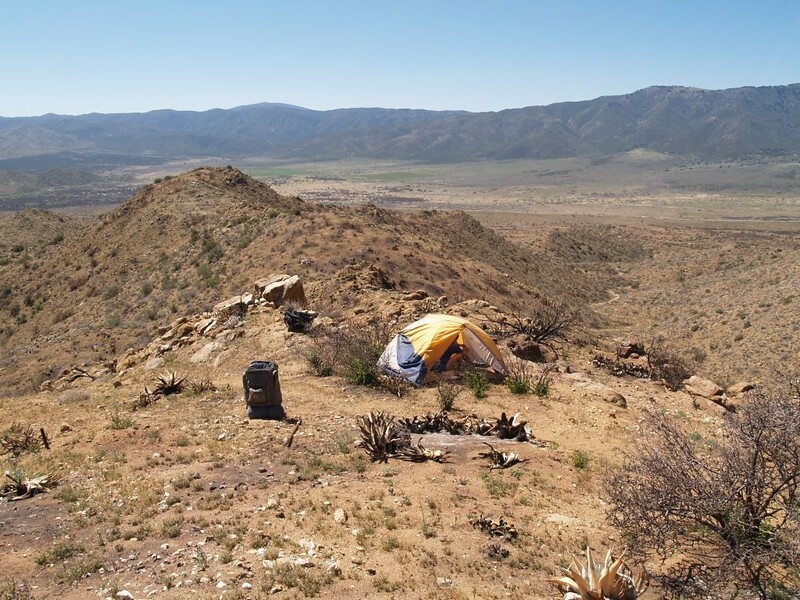 We originally had planned to do it as a dayhike, but after the blisters of the previous 16-miler, we decided that 24 miles required an overnight stay, even though it meant carrying more weight. Normally, there would be no water at all on this lonely stretch of trail, and we’d have to carry two days of water (which is prohibitive) but we were in luck: Internet sources told us that some PCT “Trail Angels” had come to the rescue and dropped off a cache of water not far from the trail, out near the midpoint of this trail section. This time, however, we decided to cheat a bit. We would hike the trail from north to south. Why? Elevation change. The north end began about a thousand feet higher. Sure, we’d be climbing and descending more than that along the way, but the net result would be a downhill hike. We also enlisted our son to drive with us so that we would drop our car off at the terminus. 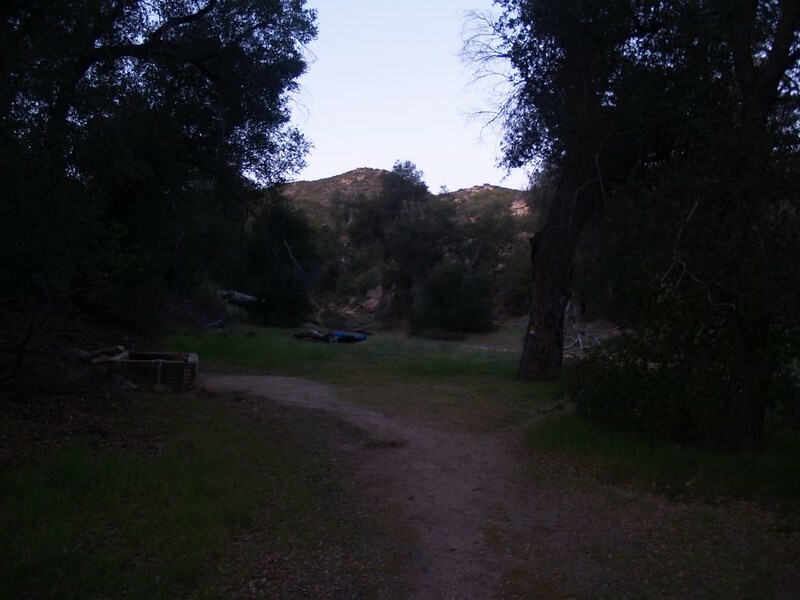 We arrived at the trailhead a bit before dawn. We had five miles of gradual uphill to do and the cooler it was the happier we’d be. We hiked past Barrel Spring (which was running well) and began the long slog. Ten miles to go; five up and five down. The sun rose all too soon, and unfortunately we were on the east side of the range. But it was still a clear and beautiful morning. 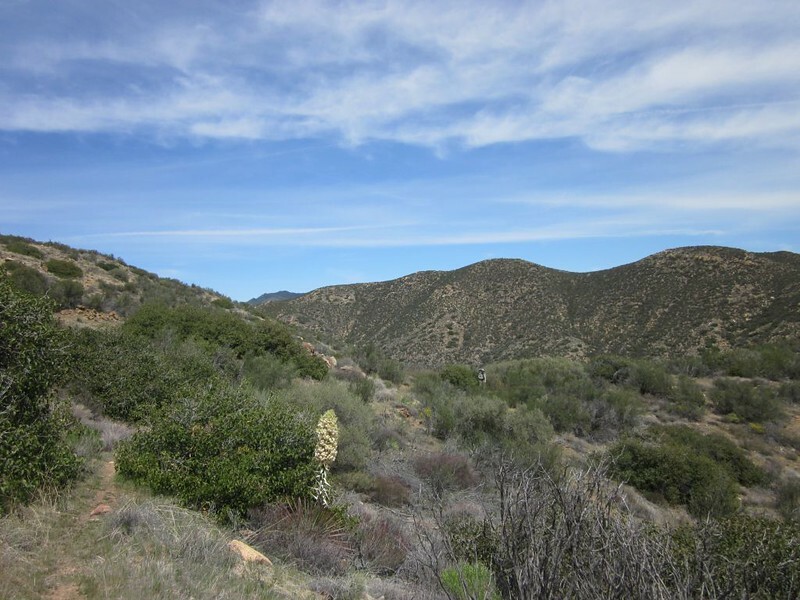 The flora was mostly of the chaparral variety, with few to no trees, and while it wasn’t great from a shade perspective, it was generous with views of the surrounding countryside. Some of the bushes were lilacs, flowering blue and white, wafting a fine perfume as we walked along. 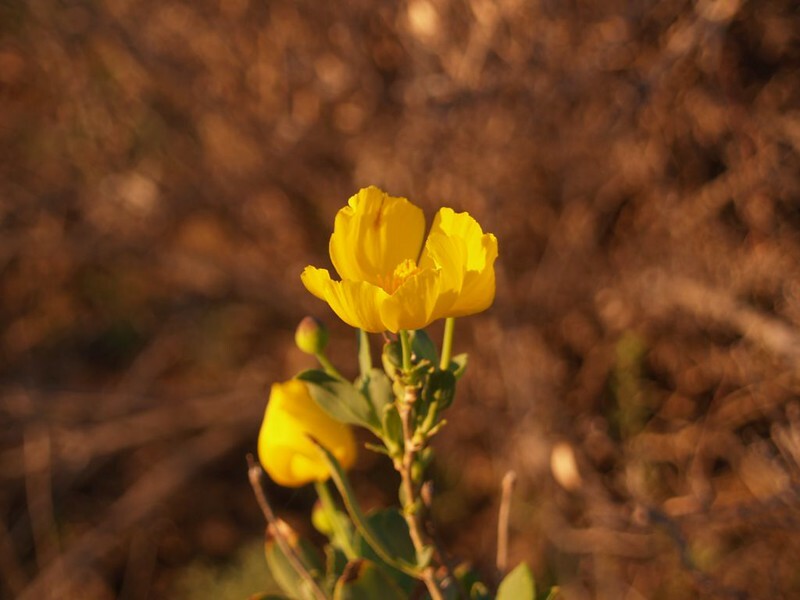 It was springtime, and there were flowers of all sorts along the trail. The grass had yet to turn brown for the long hot summer; they were happy grasses, lush and green, their long stalks bobbing, heavy with seed. We took a break at the top of a long grade, where the trail reached a fine viewpoint. 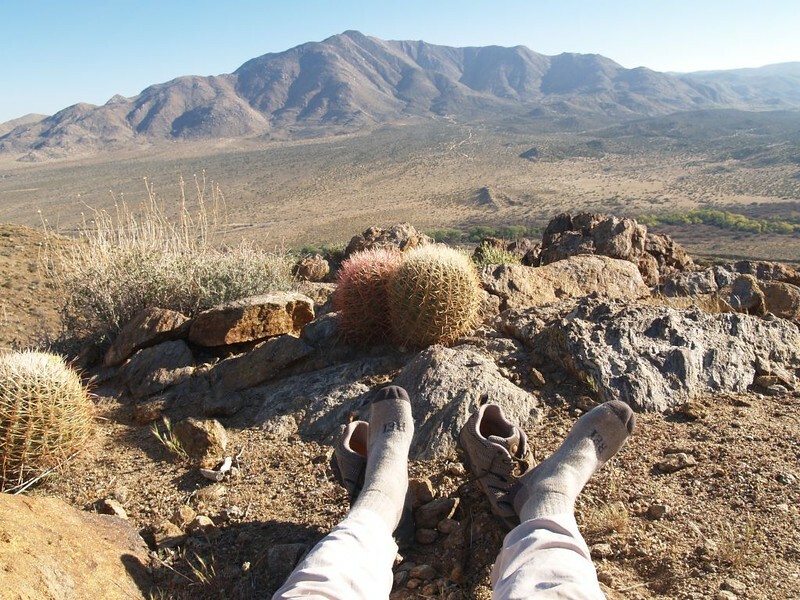 We took off our packs and sat on some nice rock ledges, looking out over the country town of Ranchita. We had some salty snacks and some water. I took too many pictures, as usual. I even powered up the cell phone, got plenty of reception, and called my mom. I texted the kids that we were OK and having fun, then turned off the phone before they could reply. We didn’t come out here to be part of civilization. 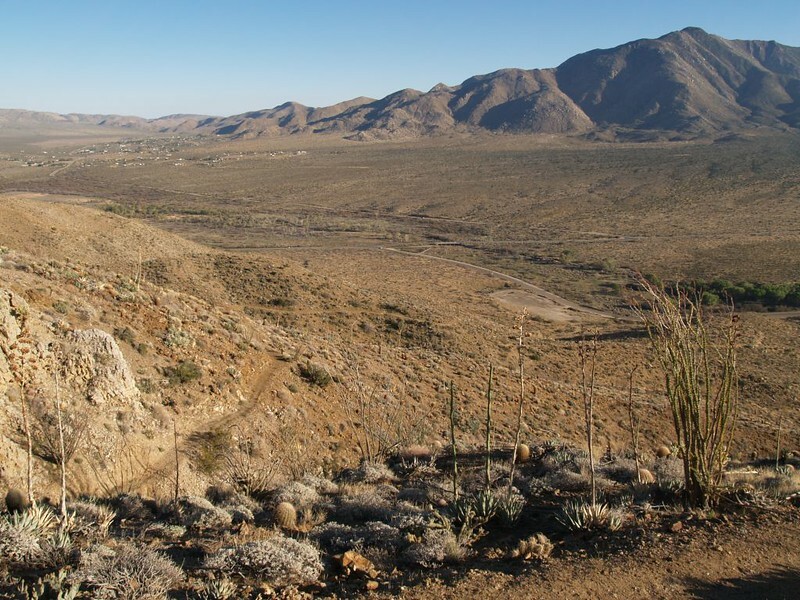 Eventually the trail crossed over the ridgeline of the San Felipe Hills from the east to the west side. About noon, naturally, so the sun would continue relentlessly beating down on us. Sigh. Still, we found a bit of shade under a bush and had some lunch. Vicki lay down directly on the trail and took a half hour nap. She doesn’t do well when it gets too hot. The temperature was in the mid-seventies, which doesn’t seem like much, but the sun made it feel much hotter. 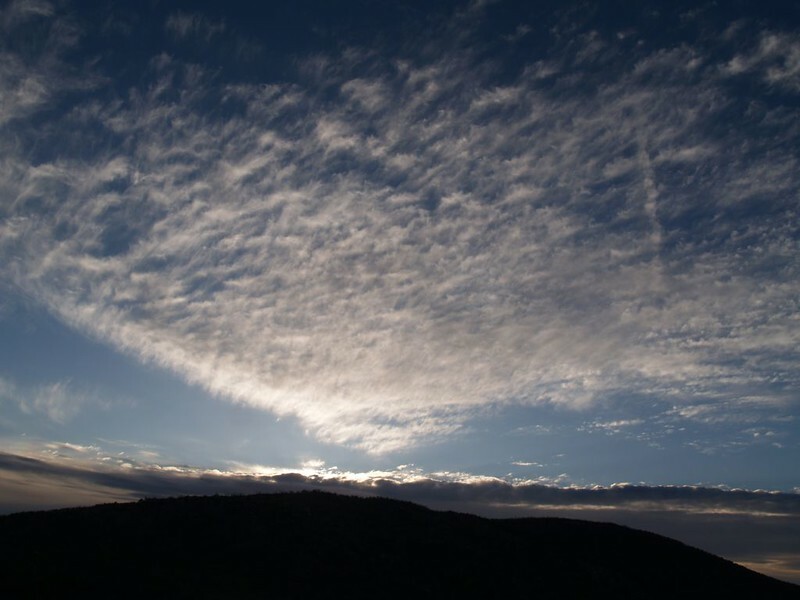 She woke up feeling refreshed, and on we hiked, gradually heading downhill for the next five miles. 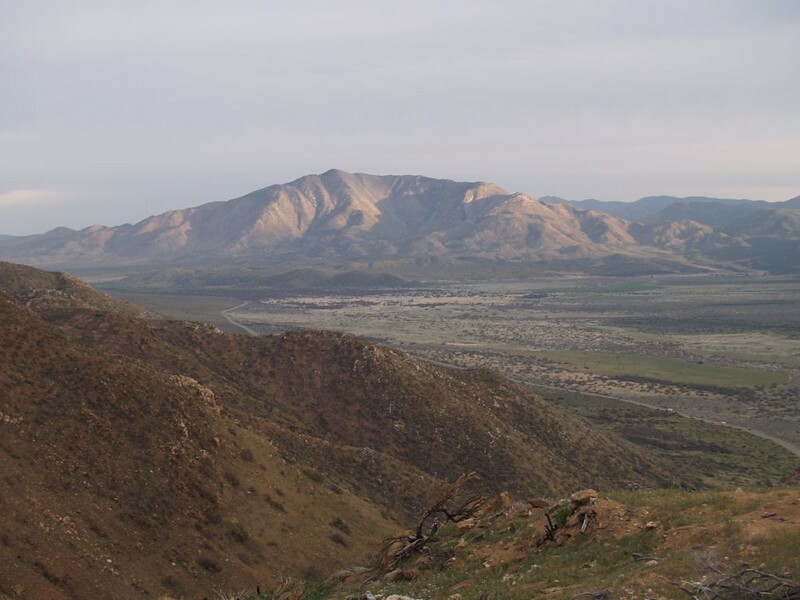 On the west side of the San Felipe Hills, the views were all about the Volcan Mountain range, the San Felipe Valley down below us, and Granite Mountain (our old nemesis) in the far distance to the south. Highway S2 meandered along the valley below us, the cars and trucks tiny, like lines of ants. Caravans of trucks with big trailers were heading to the Ocotillo Wells Vehicle Recreation Area, “desert rats” intending to spend one of the last winter weekends playing with their off road vehicles. 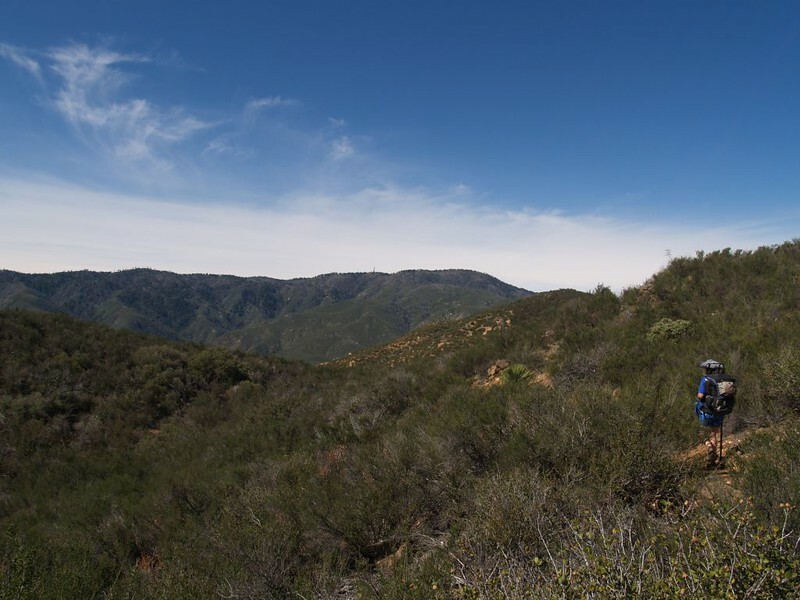 The PCT does a LOT of winding on this 24 mile section. It traverses along the side of the mountain range, so it has no choice but to go far inland when there is a side canyon. And the entire time it follows the same continuous grade. It was as if a surveyor across the valley (up high in the Volcan Range) made an imaginary transit line and then insisted that the trail follow that line, whether it made sense to do so, or not. Thus, the trail was MUCH longer than necessary. This made us angrier and angrier as the day wore on. It was exasperating, to say the least. Nonetheless, we eventually made it to PCT Mile 91, where the water cache was located. 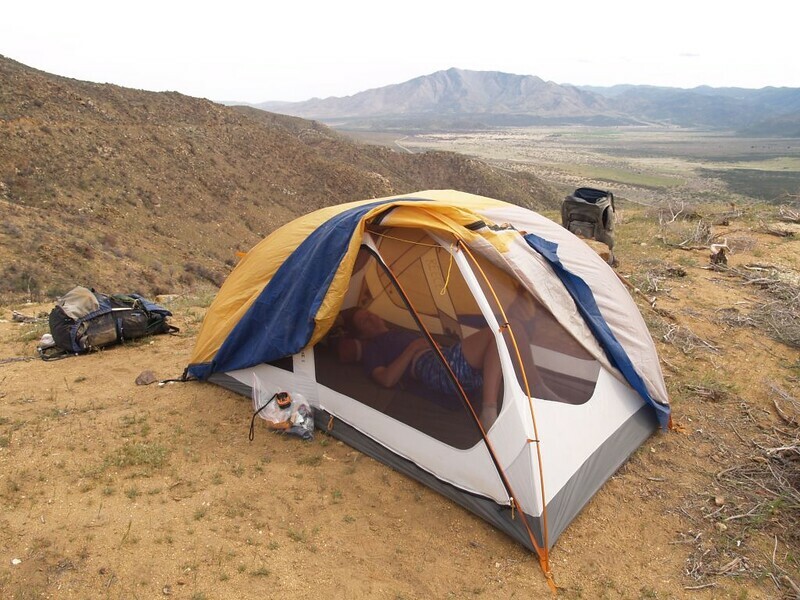 We still had plenty in our packs, so we set up the tent first. 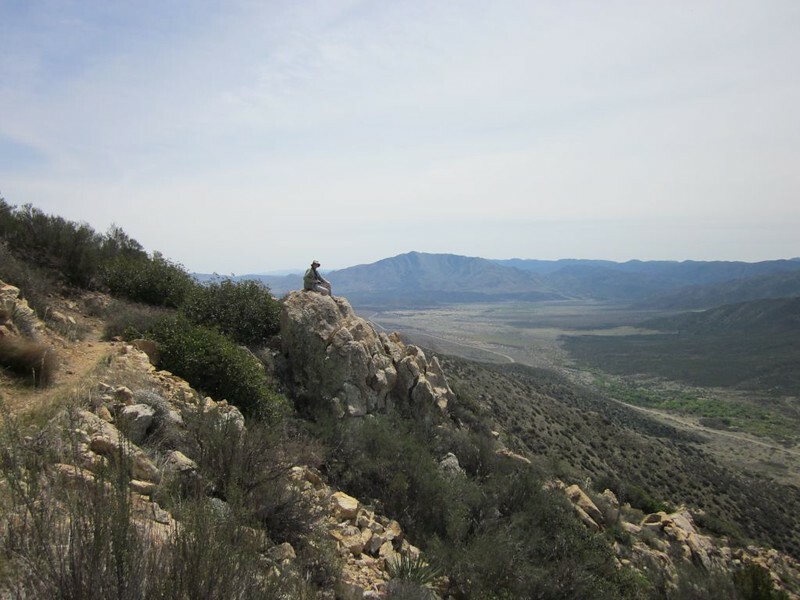 We picked a spot out on a ridgeline that jutted west toward the valley below. The views there were awesome, and it was fully exposed to any breeze blowing up or down the valley. 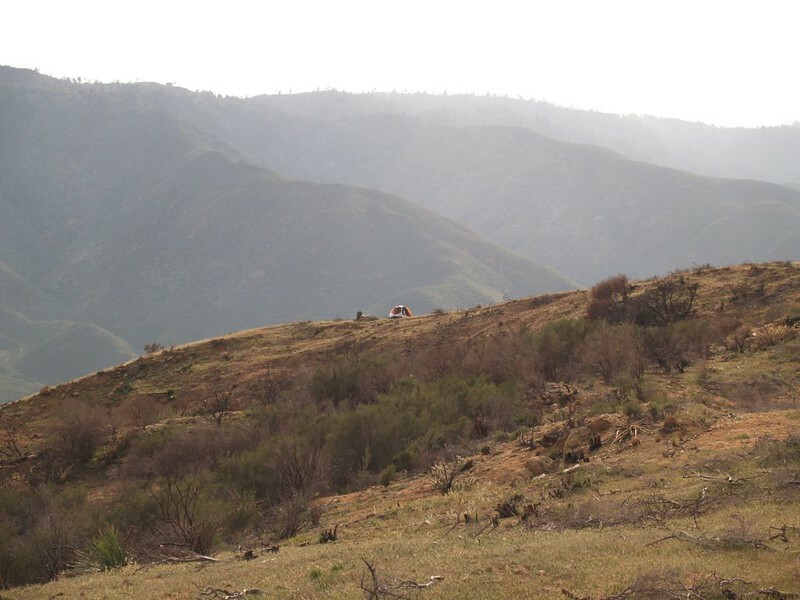 It was easy to find a spot, too, as a fire break had been cleared along the ridge in the recent past. 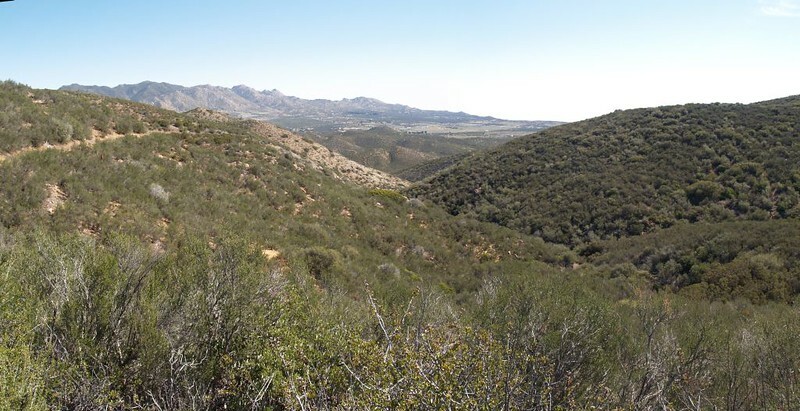 Otherwise, it would have been completely covered in chaparral, and we would have been forced to camp near the water supply, a viewless, breezeless, unsatisfying spot. Vicki took another nap in the shade within the tent, while I read my book. In fact, I admit to dozing off myself, mid-paragraph. We could finally relax after the long hike. When she woke up, we grabbed our empty water containers and headed for the cache. 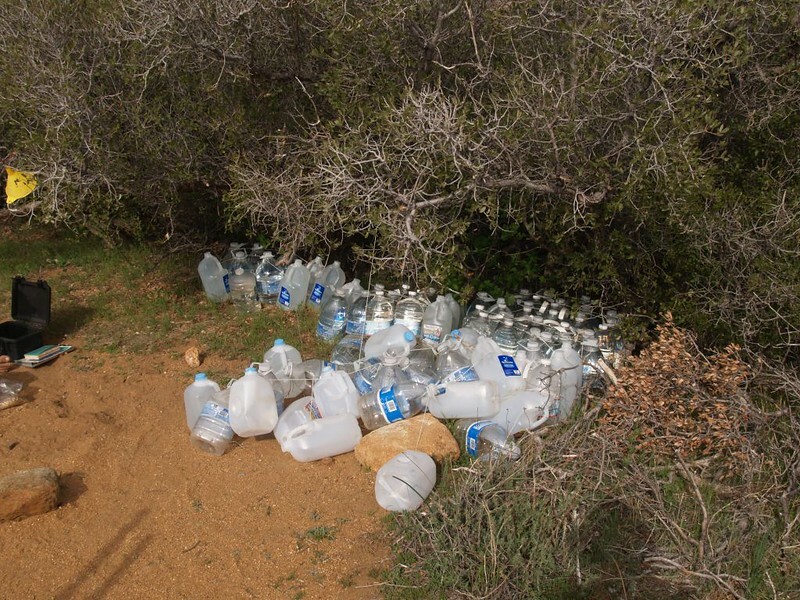 It turned out to be a huge pile of one-gallon drinking water jugs, all of them either brand-new and unopened or else empty plastic husks. They were all tied together with string so that they wouldn’t blow away and cause litter. Thus, we had carried our water filter for no reason. But that was OK. At least we knew the water was safe to drink. We met two northbound PCT hikers at the cache. They were originally solo hikers but had been hiking together temporarily. One was from Vancouver, Canada. He was traveling ultra-light, with only a down jacket for a sleeping bag. The other had a big pack, and bigger blisters. His feet were a mess. He’d been hobbling along on two raw stubs of pain for the past day or so. He needed some time to heal, but he was still ten miles from the nearest road. Meanwhile, he was applying duct tape to his red hot feet, hoping thereby to relieve the friction. We wished them well and headed back to camp. We never did find out what happened to him, namely, whether he continued his Thru-Hike of the PCT or was “through” hiking on the PCT. We ate dinner and went to bed before dark. We were exhausted. The breeze kept up all night long, but we were too tired to be kept awake by the tent fabric flapping and slapping. At least I was. I think Vicki used earplugs. It was still breezy when we woke up to a lovely sunrise. We packed up fast and started hiking, headed for a more sheltered spot just around a corner and out of the wind. We got out the stove, cooked some food, and had a nice breakfast. Then we continued onward, hoping to finish the last of the uphill hiking before it got too hot. Bellies full, we bagan hiking in earnest. 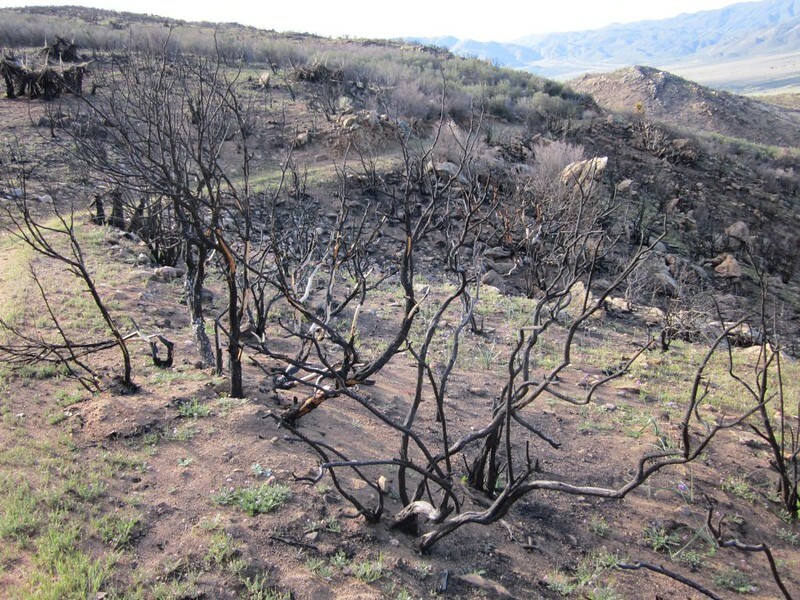 All too soon, we were saddened to discover that all of the vegetation for miles had burned recently in a raging wildfire, the Stewart Fire of August 2012. 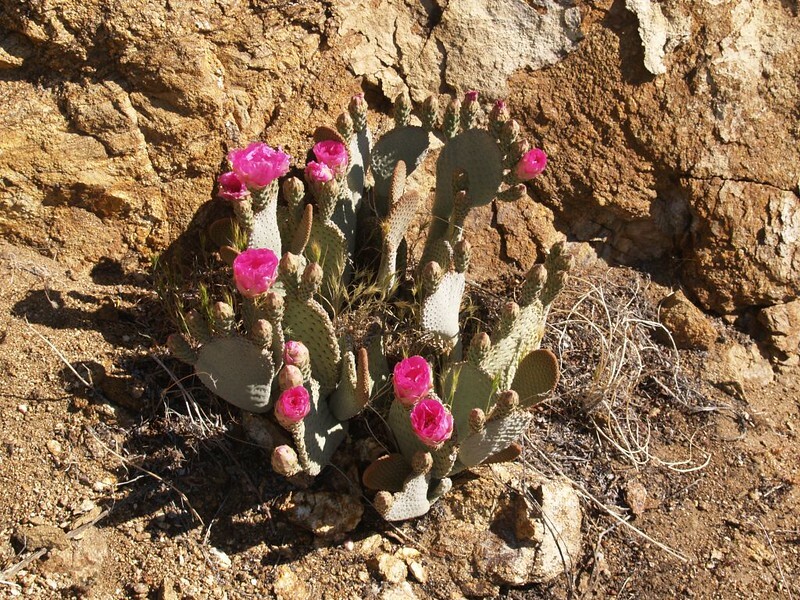 It was like walking in a nightmare, seeing the blackened bones of cactus carcasses grasping upward from the lifeless rocky soil. But it wasn’t all dead. The winter rains had been less than usual this year, but there were grasses and other small wildflowers poking up here and there, if you were willing to look for them. Sometimes we would hike around a corner, and suddenly be confronted with a beautiful hillside of flowers. 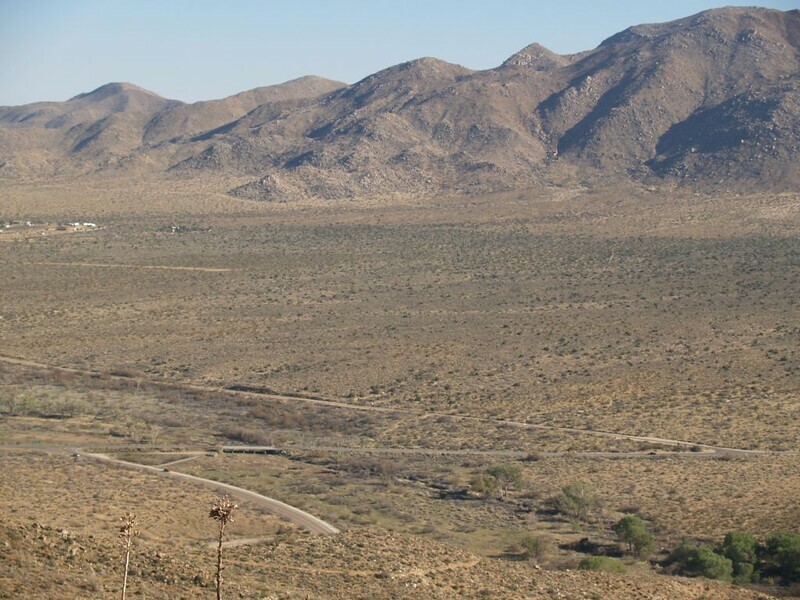 And, as is true of most wildfires, there were hidden places that never burned at all, showing us what the desert had been like not too long ago. What a contrast these places were with the burned zones! Around noon, it was warm enough that Vicki was overheating. The temperature was in the upper seventies, but there was no shade whatsoever. She doesn’t do well in the heat, and needed a nap and a cooldown. 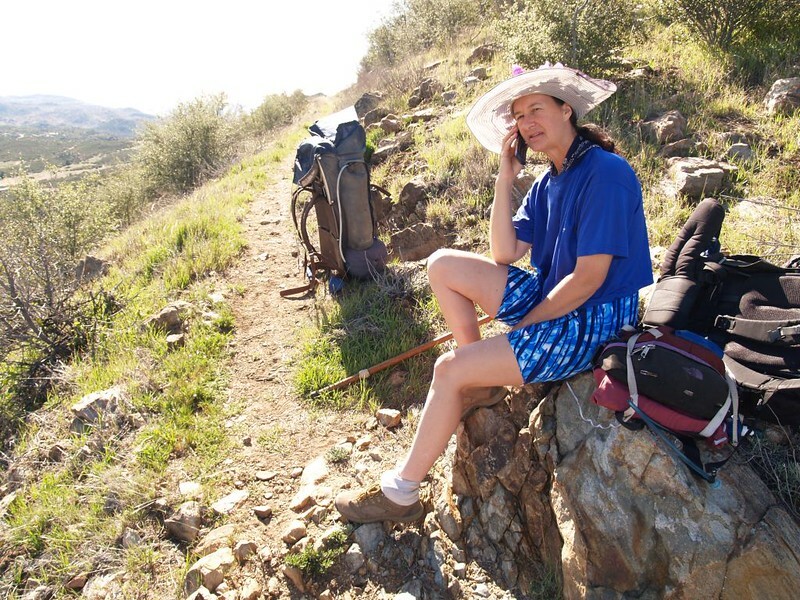 Meanwhile, we had to hike fifteen miles that day, so I wanted to keep going, to avoid hiking at night on an unfamiliar trail, but one look at Vicki was enough to change my mind. She was whupped. I got out the tent to provide our own shade, and we set it up on a point of land that had plenty of breeze blowing by. We left the tent rolled up, and only set up the footprint, poles, and tarp, which we propped open. Plenty of air and shade. Vicki lay down and fell asleep almost instantly. I, meanwhile, got some lunch, water, and my book ready. It looked like we were going to be here for a while. I took some photos, then sat down and read my book. Very relaxing. Soon enough, I, too, fell asleep. It was perfect napping weather. Eventually we woke up, feeling refreshed and ready to hike. Of course, we had to put the tent away, but we’re pros at that now. It was in my pack in less than ten minutes. It was around two in the afternoon, still the heat of the day, but Vicki was feeling better. We soaked her top in water to provide some additional cooling, which helped a lot. She also keeps her hair wet when it’s hot, which she claims does a better job than perspiration at keeping down her core temperature. Whatever it was, whether the nap, the soaking hair, or the wet T-shirt, it worked great! Vicki was once again hiking along like a trooper. Maybe we’d make it out before dark after all, I thought. On we hiked. And on. This was going to be a long day. 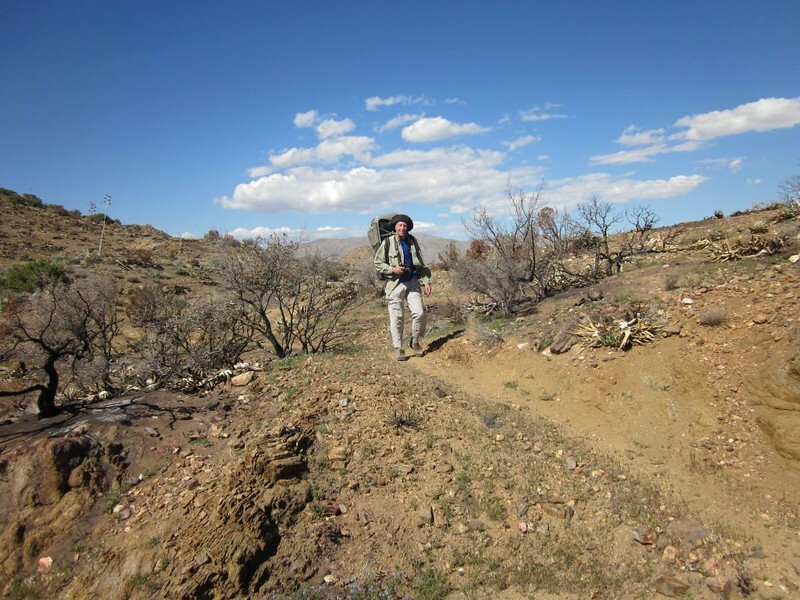 The burnt terrain was really getting to us, but we didn’t have much choice; we’d keep hiking if we wanted to get home. Finally, Granite Mountain, a fixture at the southern end of the valley, seemed to be getting nearer. We’d been seeing it constantly, from far, far away, since the day before. The closer it got the better: Because our car was about a mile in front of it! On and on the trail goes, side-hilling the entire way. Grantie Mountain is far ahead of us. At one point I checked the GPS. I scrolled the little arrow over to the spot where our car was. It said three miles. A mere three miles! But this was miles as the crow flies, not as the trail wanders. A closer look at the mileage waypoints on the trail itself (that I had pre-loaded into the unit earlier) revealed that we were still eight miles away. Eight miles! How could that be? That’s an awful lot of useless trail. But it was true. There really WAS an awful lot of useless trail. So on we trudged. At least the grade was easy. In fact, it began to trend downwards, which made things easier. And the fire-scarred areas began to recede. 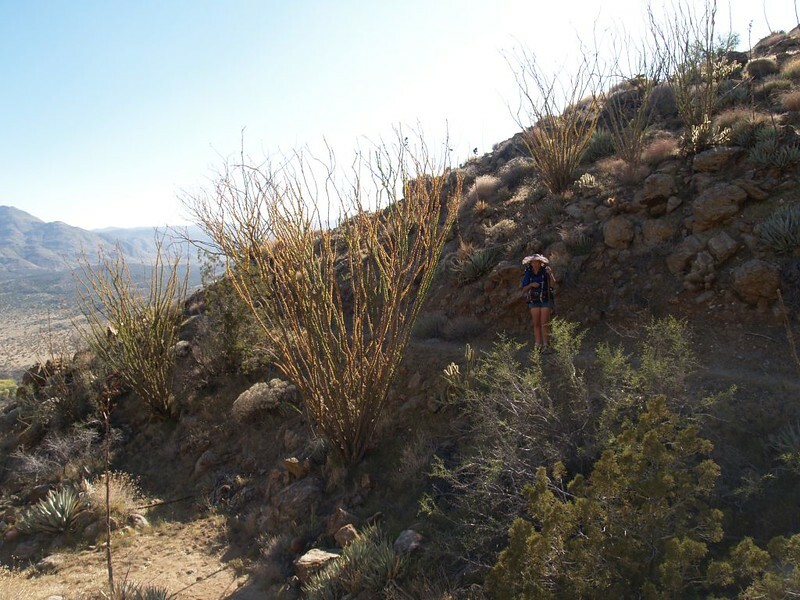 We started seeing healthy desert scrub: Cactus, yucca, century plants, and the occasional juniper. Much more pleasant. In one of the larger side valleys, huddled on a cooler northerly slope, we even found a grove of Live Oak trees. Ahh. It was nice to see some trees surviving in the desert. True, they were small, but they were trees nonetheless. 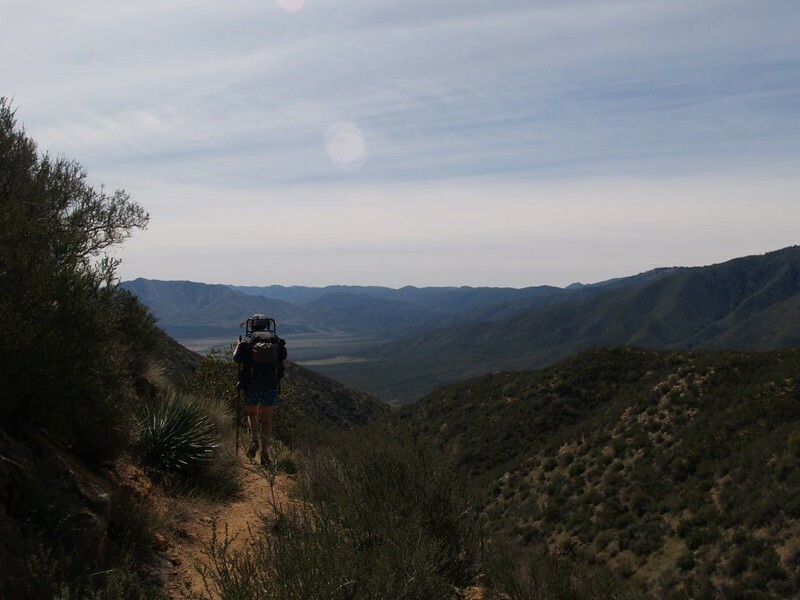 As the trail wound in and out of side valleys, it would eventually reach points far enough out to reward us with excellent views up and down the main San Felipe Valley. This was when we would take stock of our progress, and often stop for a short break. One of our goals, naturally, was to see our car. Thus far on the hike it had remained hidden behind various spurs of the mountainside, but we could see the roads leading to it well enough. Where the two roads met, there would be Scissors Crossing, the end of the hike. And, lo, late that afternoon it finally appeared! But where was the car? We could see other cars on the road just fine, even though they appeared rather small to the naked eye. 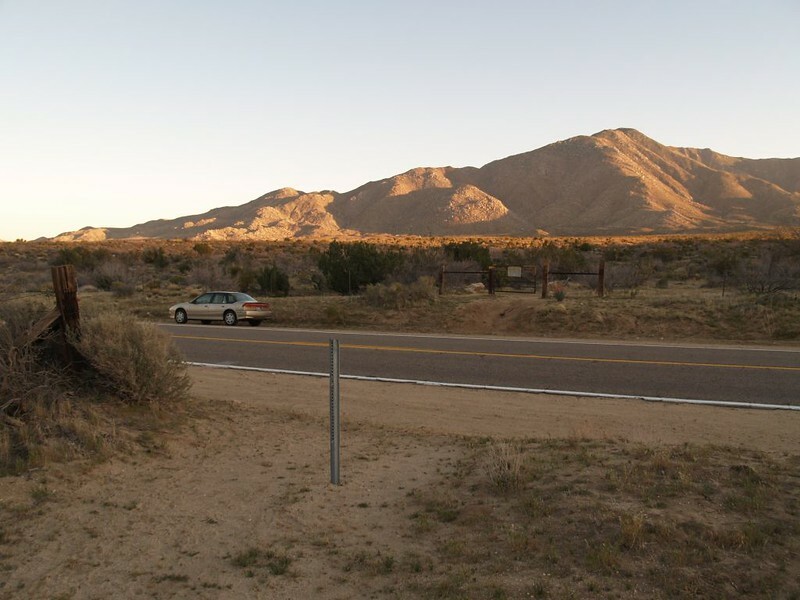 The car was parked on the side of Highway S2, over a mile away, over a thousand feet below us, in what we knew to be plain sight from here, but it was the exact color of desert dirt. In other words, it was probably invisible. Arrgh! It was so aggravating! Naturally, we had no binoculars, so on we hiked, not knowing whether it had been stolen or towed away. We were pretty sure it was merely camouflaged; this senseless worrying had to be the exhaustion taking its toll on our sensibilities. Zoomed-in view of Scissors Crossing from high above. Can you see our car? Me neither. We kept hiking. The trail was descending continuously, though not steeply. We took another “shoe-off” break to let our hot feet and damp socks air out. It felt great to sit down, with a beautiful view in front of us and a cool breeze blowing by on our feet. Heavenly. Or it was for me. Vicki liked it too, but her feet were developing some major “hot spots” and required additional care. She got out the moleskin, duct tape, and scissors, then used them to create custom bandages which would cover/protect the hot, tender skin from further abrasion. My feet had been duct taped (since the beginning of the hike) on the places where they got blisters last time, so they were OK. I often used these shoe-off breaks to replace the tape when it shifted or drifted. Not long after this, Vicki began to hobble. Both of her feet were in serious pain. She was not a happy camper. She took some ibuprofen, but it didn’t do much for her mood. People who are in pain are often grumpy, and its hard to blame them. But that doesn’t make being in their company any better. I decided to hike a bit further ahead than usual, as she was slowing down due to the pain. I also did the most intelligent thing under these conditions, which was to shut my mouth. Still, its hard to be silent when objects of interest and beauty reveal themselves. 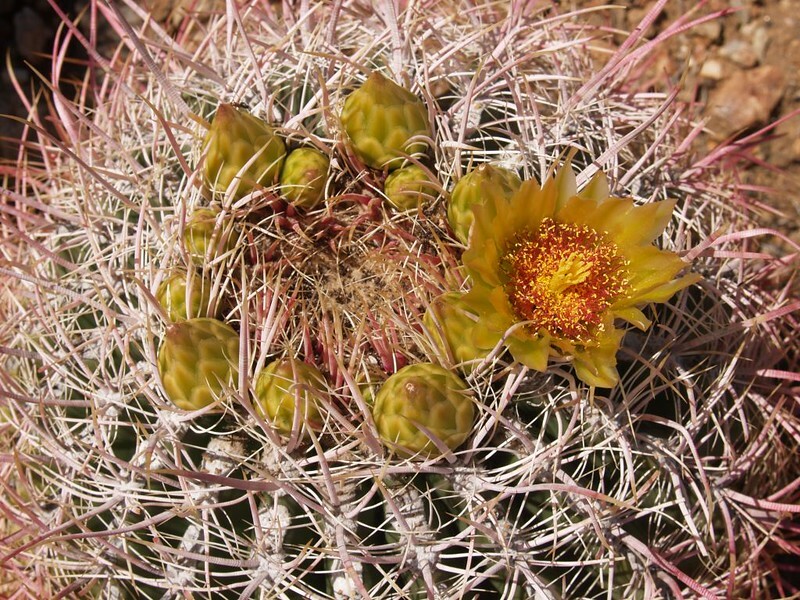 We enjoyed the sight of some ocotillo plants, the first we’d seen this trip, and the small “forests” of barrel cactus. The sun, now low in the west, was shedding a mellow golden light over the rocks and plants, and Granite Mountain was looking truly awesome across the valley in the waning light. And, last but not least, we especially enjoyed the sight of the trail as it finally decided to descend in earnest, switchbacking below us down toward Scissors Crossing. We were going to make it out before dark after all! We continued to search for a positive sighting of our car, as we were about as close as we’d get to it while still being high up on the mountain. I swore that I saw it, but Vicki was convinced that it was only a boulder. But there ARE no boulders on the side of the road, I told her. Still, she wouldn’t budge. But I knew that I was right, so I felt much better. It must have been a trick of the shadows, and the coloration of the car, I insisted. But she was adamant, as unmoving as that giant boulder. Meanwhile, the trail took its own sweet time descending. It’s slope was shallow, and it meandered around too much. I was beginning to wonder if the builders of this section were paid by the mile, rather than for connecting Scissors Crossing with Route S22. But we couldn’t do much about it, except hike. We saw a large paved parking lot just below us, and realized that we should have parked there, not over beyond Scissors crossing. It would have saved quite a bit of hiking. 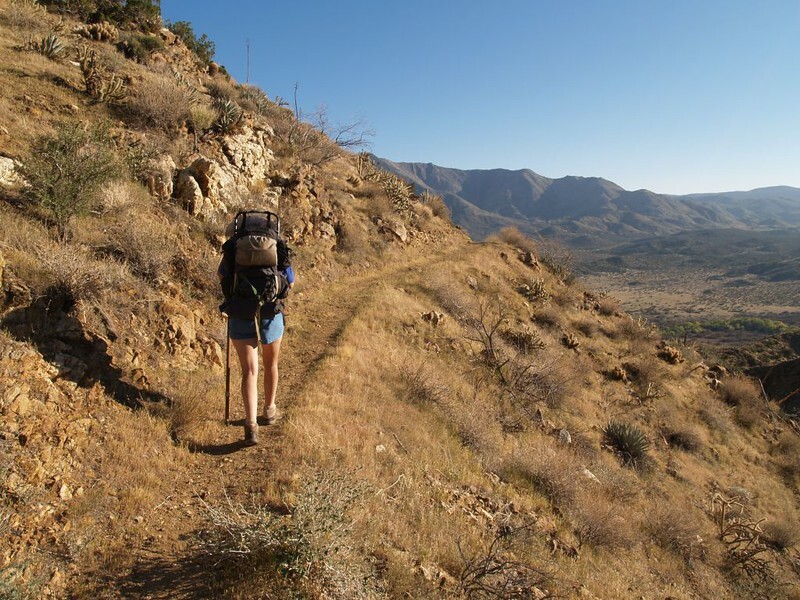 When we finally reached the bottom of the mountainside, we decided that Vicki and her damaged feet would limp to the parking lot and wait for me there, while I hiked onward to the car. This was a great idea. I hiked across the valley floor at a much higher speed. I made it to Highway 78 and crossed it. 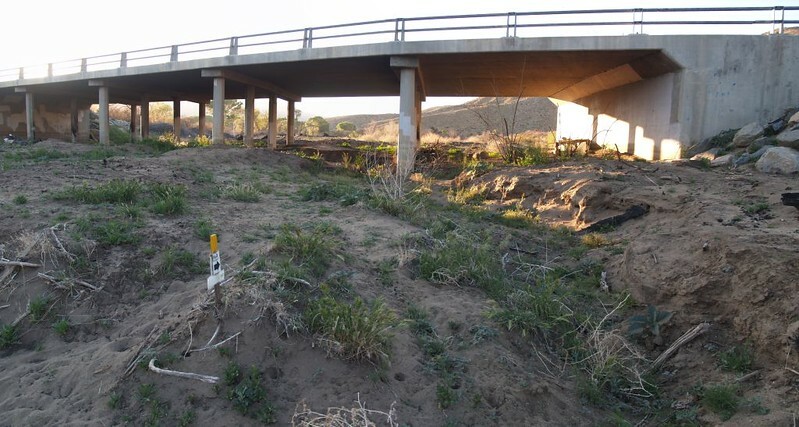 The trail ran right along the highway on the south side (private property), until it dropped down out of sight into the dry streambed of San Felipe Creek. Route 78 crossed the creek on a cement bridge, and under the bridge were yet more jugs of water that the PCT Trail Angels had left for the through hikers. I checked it out, but didn’t stay long. Just the same, it was about as pretty as an under-the-overpass scene could be, as the last daylight lit the water cache before setting behind the Volcan Range in the west. I hiked the final 100 yards to Highway S2, and found the car. And, yes, it looked exactly like a boulder (I’m writing this to make Vicki happy). I opened the doors and loaded my pack inside, and shut down the GPS. I grabbed a soda from the trunk and guzzled it as I drove over to the parking lot, where Vicki was patiently waiting, sitting on top of her pack with her boots off, her duck-taped toes wiggling in the breeze. I gave her a hug and helped her into the car. The hike was over. While I changed out of my hot boots into some light sneakers, we spoke about the hike. Conclusion: It had been a long and not overly tough hike, but the extensive burnt areas made it far less beautiful than it could have been. 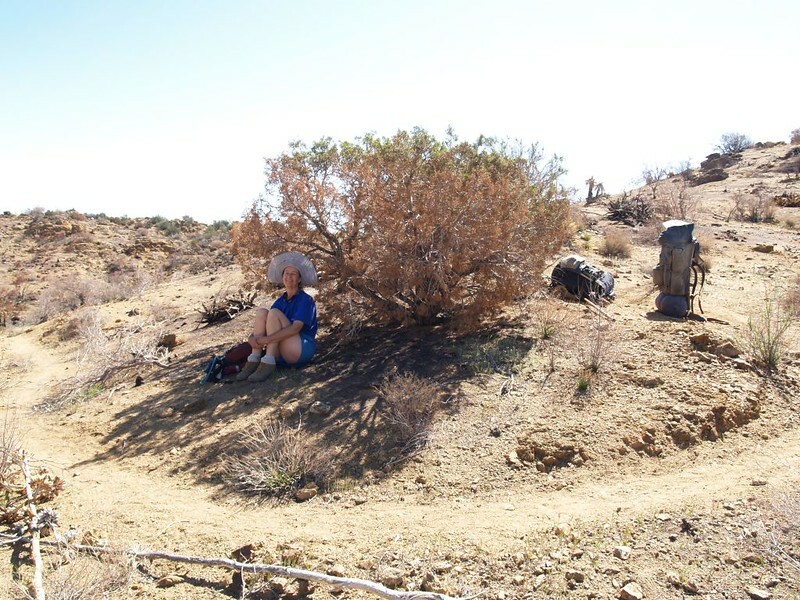 The two of us agreed that we were glad we had completed yet another section of the PCT, but also that we would never hike this section of trail again. 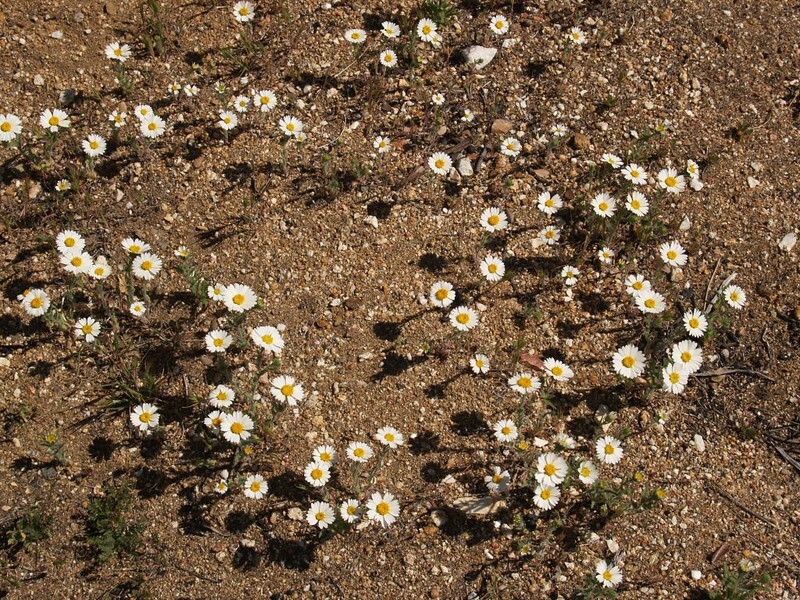 Maybe it would be better many years from now, when the desert had re-grown, during the spring on a good year for rain. What was next? 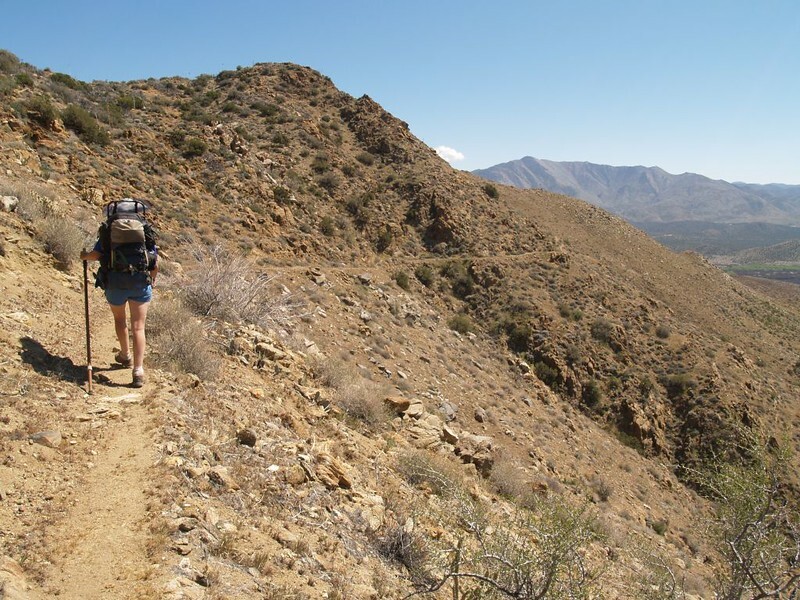 The section north of Warner Springs, 42 miles of hiking through arid high desert chaparral to the town of Anza. 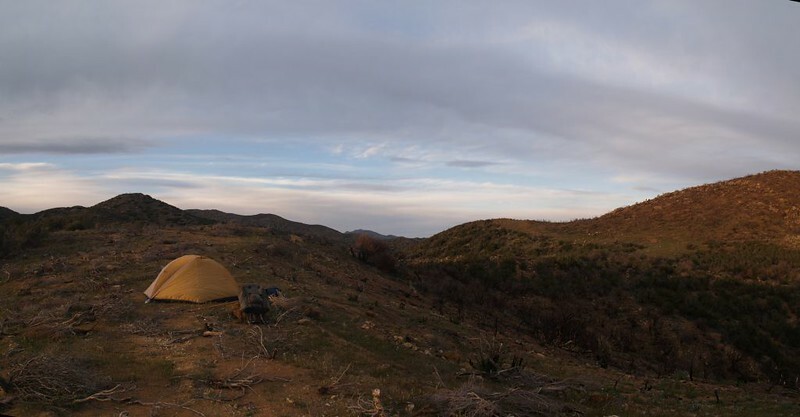 It sounded like a nice three day trip, though rather dry, and an otherwise excellent continuation of our recent PCT explorations. For more photos from our trip please see my Flickr Album Page. 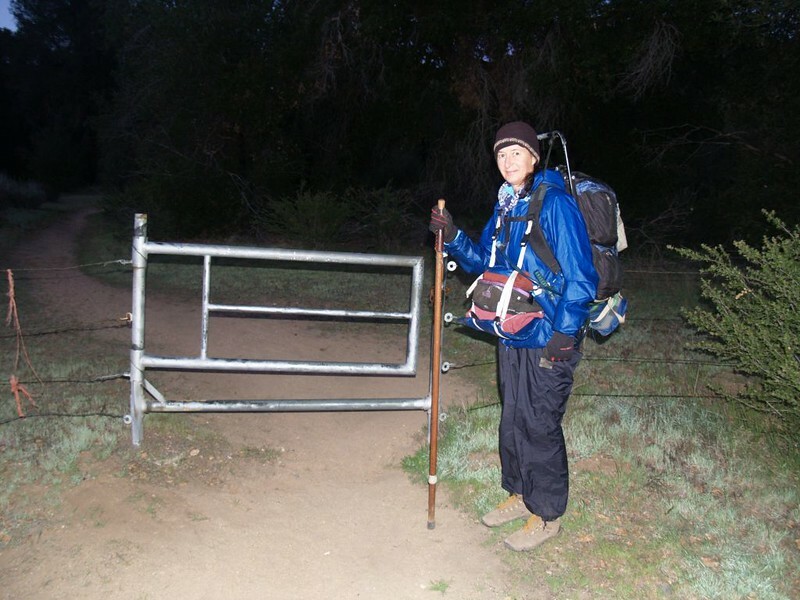 For a topographic map and GPS track of our hike see my CalTopo Page.